Why do a Large Number of Experienced and Savvy Investors Buy in December to March Winter Months? For a few personal reasons, some people have no time limit (expiration of apartment lease, etc. )and so they really wait until they find something they love to do before purchasing like marrying, which can come at any time, including the snowy winter months as well. Also, if a property has not sold over the busier season (spring and summer), owners as well as realtors tend to drop the asking price a little to attract more investors to the property. So sometimes, you can get a better deal on a property in the winter months as opposed to the months where the most investors are searching the housing market. Investors think that there is a possibility of better deal to be had….but, many times it is not so….you need right investor agent who can navigate thru this surfing and searching. There is one good reason is that there are fewer sales and fewer investors in these months so some investors see that as a great time to get a deal. Some houses do not show up in the realtor search as it is in the batches on system for group of years like under 5yrs, under 10 years & so on, so those comes up as soon as the new year starts, also the possible search criteria also changed altogether. If a seller has placed a conditional offer on a new home and theirs is still not sold by the winter, you may also have an easier time negotiating as they have deadlines to sell their home, so the Investor have an opportunity. Each selling and purchasing decision is based on a variety of different motives. It’s often case by case and so does just like credit ratings its all depends on individuals. Don’t be fooled though, some of the statistics I have seen have shown that December is also a good time to sell, and recent years you can verify mls.ca stats, winter months are not bad producing months as well, Because fewer inventories on the market mean less competition, and if investor is in need and do not want to wait despite realtor try to wait for new match property comes up in market. Sometimes good houses do not sell because the competition is fierce and even though they may be priced and war of price so hot, to-gather competitively, they fail to sell because if excess inventory levels. Over major portion of the houses listed in GTA last year in December sold. This made it the number: one month to sell if you want to have an edge on the market inventory if you think and plan properly and willing to take risk with good experience agent and with lots of ice over the head. Some of my clients save up and buy this time of year. Most investors do not want to be bothered over the Christmas season but investors know that offers at this time of year are scarce at best. This is the time of year when those of us agents that represent investor investors are the busiest. Feel free to contact me if you wish to explore the investor market, there are a lot of great deals out there right now that my clients are snapping up! Would you like to wait or go depends on your choice. Another good reason is that in winter months only serious sellers remain in the market just like serious investors and price the property accordingly well to sell and ready to make a deal before spring market competition starts. Negotiations take place well when both parties are motivated. An experienced Realtor can get you a great deal in winter. Scarborough RT to close between 2015 and 2019 | Scarborough TTC riders will be stuck with buses for 4 yrs. 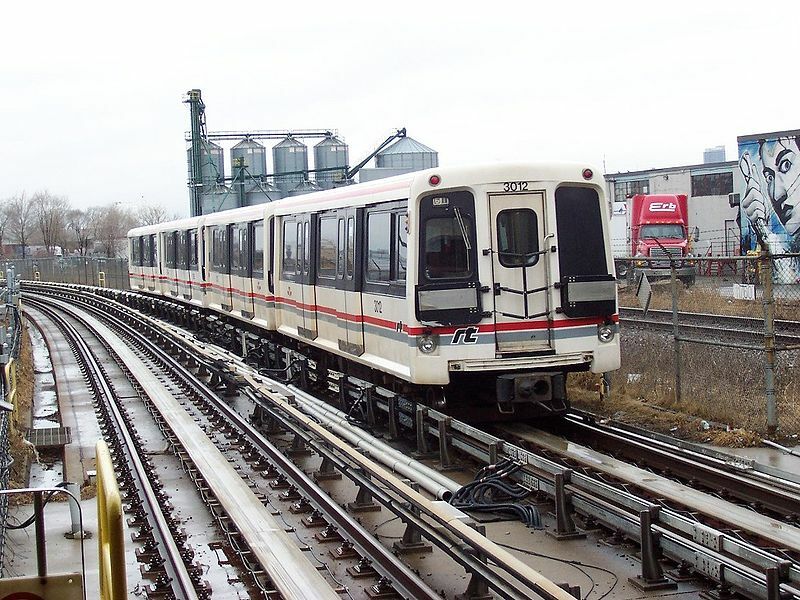 TTC ridership in parts of Scarborough is expected to plummet after the 2015 Pan American Games as the obsolete rapid-transit line is shut down for four years of construction, warns general manager Gary Webster. Dozens of extra buses will be added to the route between Kennedy Station and Scarborough Town Centre while the updated light rail system is built, but Webster thinks people are likely to return to their cars until the LRT opens in 2019. “We’re going to drive people away from transit, there’s no question,” he said, noting that a parallel bus service that’s operated for years alongside the SRT has never been embraced by riders. Meanwhile, Webster said the full length of the Eglinton-Scarborough Crosstown LRT won’t be done until 2022, although Metrolinx maintains it can be finished by 2020 and is considering a public-private partnership to speed things up. To any constituents who are angry they’ll be stuck with buses during that time, local Councillor Chin Lee says: Be careful what you vote for. Lee said he had an understanding with former TTC chair Adam Giambrone that the planned Sheppard LRT should be complete before the SRT — which is on its last legs — was torn down. The Transit City plan, which included a Sheppard LRT linking with the SRT at its northern end, was cancelled in favour of the mayor’s subway vision. And the Eglinton light rail plan, connecting seamlessly at the southern end, was moved underground, which takes significantly longer to build. “Just be careful what you ask for and think of all the implications, not only just the short term,” Lee said. As he finished speaking to reporters, the mayor’s brother, Councillor Doug Ford, said: “I totally disagree with those comments, 100 per cent,” before returning to the budget committee meeting. The SRT, with its cars resembling a mini subway train, opened in 1985 to much fanfare. Today, it moves up to 5,000 riders an hour at peak periods. The TTC will put between 20 and 30 extra buses on the road to accommodate the closure, but it’s likely to take significantly longer to get from point A to point B on a bus. Left-wing Councillor Gord Perks said the mayor has let down the people who elected him. “Scarborough voted for a transportation plan that was supposed to get them more. Now they’re finding out they’re going to get dramatically less,” he said. About a week ago, Lifetime Development released an exciting sneak peek of the podium for their new condominium, The Bond. Today, we are fortunate enough to be presented with the full exterior rendering. Located at 290 Adelaide Street West, in the heart of the Entertainment District, The Bond will rise 41 storeys. Its innovative design will accent Toronto’s streetscape with a flare of modernity and sophistication. Stay tuned to our’s ResaleHomeAndCondo Blog, as we will continue to release new and exciting information on The Bond as it is released. What is THE BOND? It’s a connection, a destination, a state of mind. An iconic address in the heart of downtown, steps to the Toronto’s most celebrated culture, fashion, lifestyle and sporting landmarks. Live at the cutting edge of urban design and style in the all new condos. Connect with THE BOND by completing our small registration form. Sign-up and become a VIP to save $1000s with the best prices and exclusive deals and get priority access to newest addition to Toronto’s iconic entertainment district at 290 Adelaide Street West. Bellaria Residences, Tower 4, Booking started, Vip Broker Event on Sep 6, Dont Miss it !! Register Online now to receive more information and an opportunity to preview and purchase before we launch to the general public. Contact one of our Real Estate Sales Representative Vijay Gandhi if you have any questions. REGISTER YOURSELF AND GET VIP DISCOUNTS. By registering with us you will have Access to Prices and Floor Plans, Also you will be informed for upcoming new projects. For the third month in a row, building starts were on the rise in this country, according to new data released by CMHC. To get legal advice, you visit a lawyer; to get medical advice, you go and see a doctor; most people, to get their car repaired, leave it in the hands of a trained professional. Even to get your hair cut, you go to someone who is trained to do that job. In all of these instances, the average consumer, without specific training and resources in a given area, defers to a qualified individual. So what is it about Real Estate that is so different? … Get benifited from Licensed Real Estate Agents & Save time, money and trouble. These latest numbers signify the best three months in a row since last fall, which is welcome news to economists, who feel that this is a signal of good things to come for builders, and for the housing industry. The fact though, that there was overachieving on expectations, as well as upwards revisions on targets have not been lost on economists, who feel that this is a good sign for the economy, overall, because of the job growth and general economic stimulus that is associated with building and construction. Looking at the country, region to region, June’s seasonally adjusted annual rate of urban starts increased by 24.1 % in Ontario, and by 5.6 % in the Atlantic region. British Columbia reported a drop of 27.6 % over the same period, while urban starts dropped by 3.6 % in Québec, and by 1.2 % in the Prairie region. Rural starts were estimated at a seasonally adjusted annual rate of 22,800 units in June. looking to this numbers it sounds like its good time ahead for first time home buyers because of lower interest rates around. When you are investing in real estate, it would be nice to have a crystal ball. Barring the existence of said crystal ball, the best way to predict the future when investing is to employ some sort of strategy. For the seasoned property investor the question is certainly about what they are investing in- but as important, is where they are investing. So what factors should you look at when looking to invest in property? Also, and perhaps most importantly, property investors must consider local factors that will affect the value of their property. Beyond the where of property investment, it also is advisable to look at opportunities in terms of what kind of property offers the best return on investment. Part of a successful strategy is not only picking a location poised for growth, but of having an awareness of the needs of the local market, and of the associated properties. It’s not only about looking in the right locations; it is about keeping your ear to the ground, and knowing what to look for. It’s about keeping connected with the community, and identifying “diamond in the rough” opportunities. The good news for property investors is that there is ample opportunity to get in to markets that are poised to grow, and promise investment growth as well. we have looked at various markets across ontario like Motels, Bed & Breakfast, or Investment in Apartment or Multi Residentials industry – and at some common threads between them and, in no particular order, here are a few that have been deemed by authorities in the industry as areas to keep on the radar. This list is by no means an exhaustive one, merely a snapshot of what is happening across the country at present. The Investment Canada Act and RegulationsNon-Canadians who acquire control of an existing Canadian business or who wish to establish a new unrelated Canadian business are subject to this Act, and they must submit either a Notification or an Application for Review. Vijay Gandhi is an Re/max Real Estate Sales Rep. & independent mortgage planner- industry insider & CENTUM Agent. If you are purchasing, refinancing or renewing your mortgage, contact Vijay or apply for a Mortgage Check-up to obtain the best available rates and terms. Have you considered a 50/50 Mortgage? As always, if you have questions about the 50/50 mortgage product and whether it’s right for you, or other mortgage-related questions, I’m here to help! Whether you are planning to buy-sell-lease-invest your first home or your investment, contact us today!We’d love to hear from you! Mortgage Rates Are At Historical Lows. Easy OnLine Application. Apply And Get The Best Mortgage Rate! Please call me TODAY for a No Obligation Buyer Consultation or Pre-Listing appointment! Toronto is currently the dominant North American condo market, with more than 18,000 units being sold annually over the past five years, according to findings by Urbanation, the Toronto-based condominium market research firm, and a great number of the buyers have no intention of living in them. A number of factors are behind the explosive growth of condos in the GTA. First and foremost is an influx of foreign buyers: Offshore investors are buying up Toronto condos sight unseen for the purpose of investment. So is the Toronto condo rental market saturated? It depends who you talk to. With 20 per cent of the GTA condo market being rental, what happens when all these units hit the street this year? The quandary for investors is that rental rates are not rising relative to the increasing prices and costs paid by investors, and Toronto’s rents are much lower than comparative global cities. A study by Adrienne Warren published by the Scotiabank Group in March, is optimistic that Canada’s residential activity will remain buoyant, but rentals may go soft. “It is also highly unlikely that Canada will experience a U.S.-style housing collapse. The roughly 25 per cent correction in U.S. home prices from their 2006 peak was primarily the result of weak lending practices and high-risk mortgage products largely absent in Canada,” says Warren. “Canada’s average rental apartment vacancy rate in major urban centres edged down slightly last year to 2.6 per cent, and has remained historically low throughout the past decade. Vacancy rates for rented condominium apartments are low, at 2.0 per cent or less in six of the 10 CMAs surveyed by CMHC. transactions reported during the same time-period in 2010. The number of rental units listed on the TorontoMLS® rose 10 per cent to 9,374 units. The increase in listings reflects the high level of condominium apartment completions over the past year. Some investors chose to lease their units upon completion. With the number of transactions rising at a greater rate than the number of units available for rent, rental, market conditions tightened. Average rental rates were up in comparison to last year. One-bedroom apartments rented for an average of $1,485 per month, up 1.5 per cent year-over-year. Two-bedroom apartment units rented for an average of $1,958 per month – up 2.5 per cent compared to the first four months of 2010. 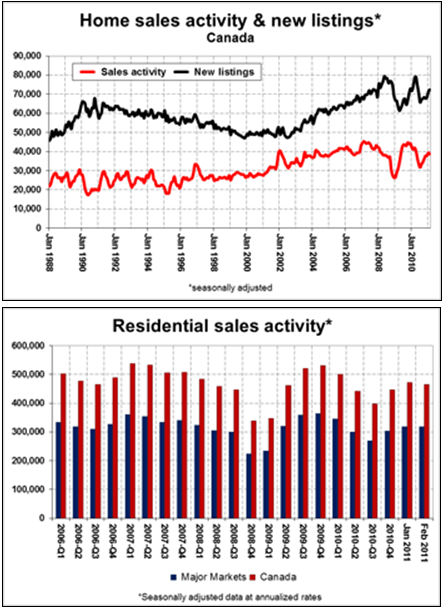 Source: CMHC Housing Now – March 2011 and March 2010. This seasonally adjusted data goes through stages of revision at different times of the year. This blog communication is for public awareness and public responsibility, for client and customer benefit and best intrest in mind. The federal government is considering new rules to make it harder to qualify for a loan to buy a condominium. The new regulations would be part of Ottawa’s effort to toughen borrowing guidelines and tamper down Canadians’ debt. The change would add 100 per cent of condo fees to the expenses considered when a buyer is applying for a mortgage. Currently, only 50 per cent of the fee is considered. Toronto realtor Brad Lamb says the move is going to push a lot of people out of the market. The maximum length of a mortgage could also come down from 35 years to 30. “You’re talking $150 to $200 more per month, which works out to $40,000 in purchase price,” Lamb said. Craig Alexander with TD Bank says the new rules might not take people out of the market completely. “It really wouldn’t take people out of the market. It would mean people would end up taking a lower mortgage and buying a lower-priced house,” he said. Prime Minister Stephen Harper acknowledged the rumours of the new rules. There is also speculation the government might increase the minimum downpayment required. Currently it is five per cent. From all economic indicators, it appears that higher interest rates are on the way in 2012. What would your monthly payments be at current home prices in your neighborhood? Compare your options using CENTUM Mortgage Calculators. Vijay Gandhi is an independent mortgage planner- industry insider & CENTUM Agent. If you are purchasing, refinancing or renewing your mortgage, contact Vijay or apply for a Mortgage Check-up to obtain the best available rates and terms. Whether you are planning to buy-sell-lease-invest your first home or your investment, contact us today! We’d love to hear from you! Please, forward my name, phone number & e-mail address to your friends, relatives, clients..
prices increase estimate 10-20% post VIP-sale. Be the first to purchase in this stunning new developments at King and Simcoe, right by the Royal Alex Theatre. There are over 500 brokers buying for themselves and for over 1,000 of their clients. We anticipate prices to go significantly higher after the VIP sale, so if you are looking to invest in an exceptional property that will become a landmark in our city for years to come, seriously consider Theatre Park Condos. To attend the VIP opening, you must be registered with us the form is here. we will confirm your attendance via email. prices will be released only at the event, however expect $650 per sq ft for mid floors. at King & Simcoe. Could you ask for better address? disclaimer: you must register with us in order to attend the VIP Sale. no members of the public will have access this sale. public sale will take place later in 2011 and we expect the developers to increase prices significantly by that time. buying at the VIP sale means purchasing at the lowest possible price point. the developers increase prices after VIP sale. recent successes such as Tableau Condos who sold 60% during the VIP sale. we anticipate that Theatre Park condos will do exceptionally well due to the unbelievable location and cutting edge design and engineering of this structure. https://gtarealtyagent.wordpress.com/ is Toronto’s blog on Condos for sale, Lofts, Assignments, New Developments and Real Estate Investments. If you are looking to buy or sell Toronto condos, assignment condos or Toronto Real Estate, spend a few minutes on this site and get informed, because knowledge is power. Want to learn more? We are Toronto’s Experts on Condos, Lofts, Assignments, New Developments and Real Estate Investments. If you are looking to Sell, Assign, Buy or Invest call us and we’ll share with you our knowledge, insights and opinion of the Toronto Condos Market, North America’s largest Condo market. Toronto represents the future of North America, and have become a a global investing destination, as prices are still reasonable, the city’s growth is steady, demand is high and new world-class designs by the world’s best architects are available and reachable. What are you looking for? Sellers! we have a team of professionals working hard on marketing, promoting and selling your listings. We promote your listing to our network of websites, to investors lists, through professional networks and other media. Our Real Estate marketing system offers many advantages that you will not find anywhere else. If you are looking to a sell a condo, assignment, lost, commercial Real Estate, business or land, consider using our services to elevate your listing beyond the noise and crowds, get noticed sooner and sell before your competition. What are you selling? Two Big Six banks hike benchmark rates by Approximately 45 BPS, Despite BOC holding its rate. Canada’s major banks have been quick to react to the Bank of Canada’s decision to raise interest rates to 1.25%. Average sales price in tight GTA market jumps 13% soaring high.